I had the opportunity to meet Becky Schlegel at the Mid-Winter Bluegrass Festival in Northglenn, CO. We went to her song writing workshop and later we saw her perform. We sat right up front and my girls were so enthralled to hear her voice and watch her play her guitar. It was just Becky, her guitar and Brian her guitar/banjo man (depending on the song). She has the most beautiful voice! Some have compared her to Jewel. I could have listened to her all night! I have imbedded this player that she shares from her website, so that you can hear her gorgeous voice. I think my favorite's so far are "Lonely" and "So Embarrassing" because they really focus on her voice. At the end of the night, she spotted me and my girls in the crowd and came over to us. She said hello to my girls and thanked them for being able to stay awake through her set that was late in the evening and full of ballads. They were so in awe and didn't know what to say to her. She complimented them and told them how pretty they were and how sweet. It made our night and we were so thankful to have gotten to talk with her in person and hear her beautiful voice and wonderful guitar. The entire weekend was full inspiration. Inspiration to open your mind, take a new perspective, try something you're not sure you can do, believe in yourself and your art.....whatever that art form is. plotting something that I must be involved in. until you are well again. I don't want whatever you have. and dust you off-- After I laugh my rear off!! 9. This is my oath... I pledge it to the end. 'Why?' you may ask; -- because you are my FRIEND! I was drinking my yummy vanilla nut coffee this morning, browsing blogs that inspire me...... and found this lovely cowgirl image and hilarious saying! I spotted it on Flatwoods Fok Art Blog and just had to share. Her post said to pass it on....so from me to you - hope it makes you smile. Hugs. I loved the sepia tone and the thought provoking quote of this vintage postcard. 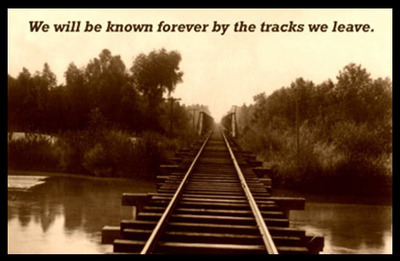 I like to think of "the tracks we leave", as the way we interact with others. People need second chances, but they need to show a lot of hard work and determination to deserve a third or fourth chance. You should always take responsibility for your actions - even when it means admitting you were wrong. It's OK to set limits and boundaries - and it's OK to say no. Determination - a positive attitude - hard work - and a good support system (friends/family) will allow you to succeed at just about everything. Your happiness, your kids, your finances, and your employment will greatly be affected by how positive or negative your marriage is. Find out what makes you happy, what you can lose yourself in, and always make time for it. There is something nostalgic about trains and railroad tracks. My darling hubby is a conductor on the Union Pacific Railroad. He gets to see so many unique areas of the Wyoming landscape. Recently, he took us to Point of Rocks, a familiar site to him, as each trip, he passes by the once prominent stage coach stop. It is now considered a Wyoming ghost town. One of the buildings is now crumbling, but the other has been restored. You could almost picture a scene out of "Deadwood" (HBO series) as the stagecoach pulled up and the weary travelers got off. I loved the old film grain and blips of this slide show. If a gray screen slides down, you may need to hit the continue button at the bottom to finish the slide show. Or click the button at the bottom of this post that says "view all images", then start the slide show. Hope you enjoy!